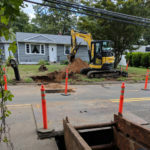 River Valley Construction, LLC is a Connecticut-based company providing sewer and water line installation for both residential and commercial customers alike. Whether you need new sewer and water line installation or to excavate and replace the current sewer and water lines, we are the best choice. If you need underground work done on your water line, you should hire a specialist. Excavation jobs often require working around buildings, existing utilities and landscaping, it is paramount to hire someone who is experienced and knowledgeable in underground work. We are licensed, insured and bonded. We pride ourselves on safety first and superior customer service.